The new US commander in Afghanistan, General Stanley McChrystal, today submitted an eagerly-awaited assessment of the war in Afghanistan that acknowledges the disastrous approach of the past eight years and proposes a completely revamped strategy. The revised strategy, in the face of the Taliban's expanding influence and waning support for the Kabul government, switches the emphasis from engaging directly with militants to winning the hearts and minds of the Afghan population, officials in Washington and at Nato headquarters said. McChrystal graphically portrays the recent strategy of western forces as the equivalent of a lumbering bull attacking a matador's cape, gradually tiring and finally being killed off. Separate from his assessment submitted today, McChrystal is to go to Washington later this month to advise President Barack Obama on whether he needs more troops on top of the 108,000 international troops already there. The strategy recommendations come as the two more British soldiers were killed today to add to the high death toll in recent months. The deaths of the soldiers from The Black Watch, 3rd Battalion Royal Regiment of Scotland, take the total number of deaths of UK service personnel since operations began in 2001 to 210. The pair were killed in the explosion while on a foot patrol north of Lashkar Gah district, southern Helmand, the MoD said. Britain is not expected to announce a major increase in the number of its troops in Afghanistan regardless of whatever the US does. Senior British military sources say Britain has effectively increased its contribution by maintaining the extra number of troops sent to Afghanistan this year to help with the elections. McChrystal, after sending his report to the Pentagon and Nato headquarters, said today that, in spite of the lost ground, the war was still winnable: "The situation in Afghanistan is serious, but success is achievable and demands a revised implementation strategy, commitment and resolve, and increased unity of effort," he said. McChrystal, who Obama put in charge only a few months ago after unexpectedly sacking the US commander General David McKiernan, has already begun to implement the new strategy, ordering his forces not to fire or drop bombs if there is a risk of civilian casualties. He has also shifted the focus from the eradication of the poppy crops, which alienated farmers, to attacking drug traffickers. A key part of his new strategy is advocating that US, British and other international forces not only train Afghan forces but operate along side them. The basis of McChrystal's assessment is contained in guidelines he sent to troops last week in which he said: "The conflict will be won by persuading the population, not by destroying the enemy." He compared the recent approach as equivalent to a bullfight. "A military force, culturally programmed to respond conventionally [and predictably] to insurgent attacks, is akin to the bull that repeatedly charges a matador's cape - only to tire and eventually be defeated by a much weaker opponents. This is predictable - the bull does what comes naturally. While a conventional approach is instinctive, that behaviour is self-defeating." The US has 63,000 troops in Afghanistan at present, with a further 5,000 on their way. Anthony Cordesman, a Washington-based strategist who has been an adviser to McChrystal, in an article in the Washington Post today, said that the US would need about three to eight more brigade combat troops for Afghanistan, which would mean anything from about 7,000 to 40,000 more troops. More troops would be politically difficult for Obama given the increasing unpopularity of the war in the US. Cordesman also hinted at the in-fighting between US commanders and civilians based in Kabul and those in Washington. He said that McChrystal and the new US ambassador to Afghanistan, Karl Eikenberry, could win only "if they are allowed to manage both the civil and military sides of the conflict without constant micromanagement from Washington or travelling envoys". The latter likely refers to Obama's special envoy to the region Richard Holbrooke. US officials and advisers involved with Afghanistan see little salvation in the recent election, especially with questions raised about its legitimacy. New vote tallies released today showed President Hamid Karzai with a strong lead over top challenger Abdullah Abdullah. 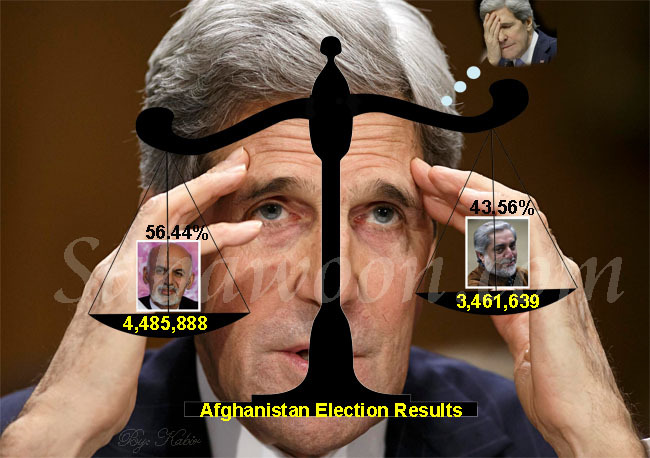 Karzai had 45.8% of votes counted, while Abdullah had 33.2%. Ballots have been counted from almost half of the country's voting stations. Karzai will need 50% of the vote to avoid a two-man runoff. In the UK, David Lidington, the shadow foreign office minister, said: "I think General McChrystal appears to be bringing together the criticisms that a number of different commentators, military and political, have been saying over the last year or more. Obviously we will want to see his report before coming to firm conclusions. But we have been saying for a long time that there needs to be much better co-ordination of the international effort in Afghanistan and much better coordination of the UK effort."